The new Stampin’ Up!® Annual Catalogue has lots of gorgeous stamp sets to choose from and one of my favourites as soon as I saw it was the ‘Tropical Chic’ stamp set, coordinating papers & dies. I finally made some time to play with these gorgeous goodies and have created some cards to share with you all. I noticed Just Add Ink had a sketch challenge this week and I thought Tropical Chic would fit perfectly. and here’s the Sketch provided. I’ve also finished off the inside of the card with some of the designer series paper I’ve used on the front. I’m finally here with a Challenge Card and am hoping to get a few more done today. With any luck I’ll get back into the swing of things ( I know I’ve said this before) and have some regular posting and creating going on. My card today uses the JAI 132 Sketch. When I saw this sketch I knew straight away that I wanted to use it for a Christmas Card. I have a few sneak peeks for you with this card. There’s new DSP, a new In Colour and a new Stamp Set. I really love the new DSP and can see me using lots of it. You’ve already seen some of it in this post of my Christmas Tree. I’m also liking the new In Colour I’ve used and the Stamp Set, well what can I say. I’ve had this one for over a year thanks to a wonderful friend but haven’t shared it on here yet as it wasn’t something in our catalogue. I’ll see if I can locate the card I made last year for Christmas and share another time. So would you like to see my card? Accessories: Corner Rounder Punch, Aqua Painter. To get some depth and a closer colour match for Cherry Cobbler with my water colouring I’ve used lots of layers allowing them to dry in between. Could probably go more but I was happy with the result. I’m sure you’ll be seeing more of this stamp set over the coming months. It’s such an old time traditional Christmas Set to me and one that’s not seasonal (winter or summer) related. It just says ‘Christmas’. This is my final week of being a Guest Designer over at Just Add Ink. This week we were give a sketch. I found this one a real challenge. I’m not overly happy with my results and plan on spending some time today recreating it with a few different touches to see if I come up with something I’m happier with. I think if I could just have some ribbon in the colour I’d prefer to have used that would even have made a difference…… Oh well with any luck their might be some revamping of ribbon with the next IB&C which isn’t too far away really. Here’s my end creation (so far). 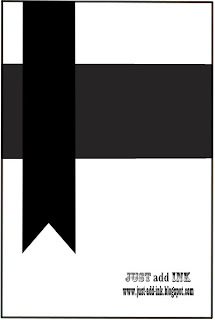 I’m sure it would like nicer straight away if we had some ‘Not Quite Navy’ ribbon to replace the Very Vanilla. I’m also thinking I should have layer the smaller pattern paper piece onto Not Quite Navy rather than the Sahara Sand so that will be something I’ll change. I also have some other thoughts about changes too so we’ll see what I can come up with later. Accessories: Very Vanilla 5/8” Satin Ribbon, Basic Jewels – Pearls. 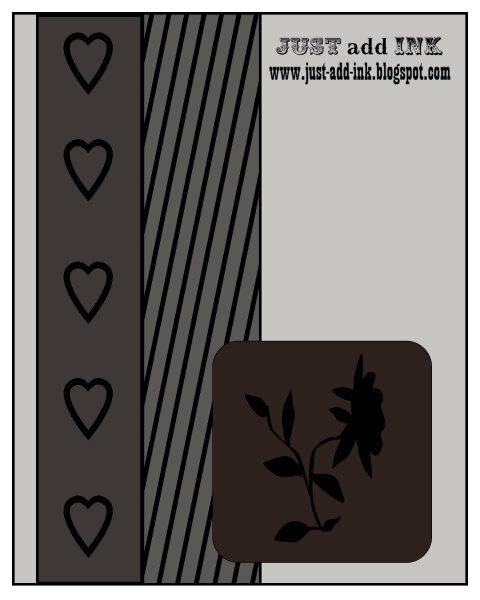 Check back later today to see how my ‘revamped’ card turns out. I’ve added some stitching, a layer of Not Quite Navy behind the print piece of dsp and changed out the Very Vanilla ribbon to some Not Quite Navy cardstock. I don’t know what you think but I think these changes lift the card more than the original. It’s the 3rd week of my Guest Designer status over at Just Add Ink and this weeks challenge is to use some colouring in your creations. 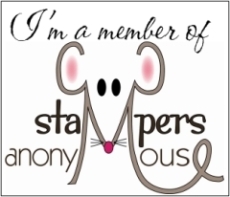 That means to use things like Stampin’ Write Markers, inkpad with blender pens or aqua painter, watercolour crayons, Stampin’ Pastels, shimmer paint, etc. I actually love to watercolour but haven’t done much of it in a while. Mind you I guess I haven’t really done much of anything for a while…..lol. When I watercolour I’d have to say my favourite way is to use an inkpad with an aqua painter so that’s what I’ve opted to do for my ‘add some colouring’ part of the challenge this week. I decided to use the ‘Every Moment’ stamp set for my creation. I hadn’t used this image yet so now it’s been inked. 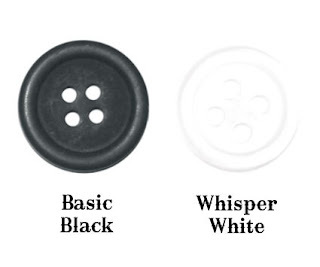 Accessories: Marina Mist 3/8” Taffeta ribbon, Basic Jewels – Pearls, Stampin’ Dimensionals, Snail Adhesive. I’m hoping to get some more things made for this challenge so check back to see what else I’ve done. Just need to get a few things done around this house this morning and then I’m planning on spending the rest of the day creating. Now it’s your turn. So get creating and hop on over to Just Add Ink Challenge 72 and upload your creation before 12 midnight Wednesday 22nd June. 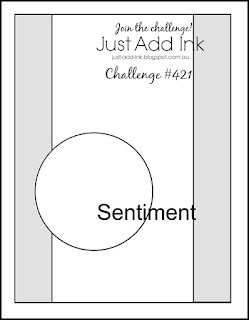 This weeks challenge over at Just Add Ink is to use Black & White only in your creation and is Challenge JAI 71. I’m really happy with how my card turned out this week, especially since it was a bit of a rush job as I’d left it ‘last minute’ to complete. I do mean ‘last minute’ too as I was making this card at around 11pm the night it was due to be submitted. That’s not usually like me but I’d overlooked it till around 2pm that day and had other things on with my family that afternoon and evening before I could sit down and create something. I’m just glad the idea and card all came together reasonably easy. The hardest part was deciding on what words/sentiment to put on it. Anyway enough rambling, here’s my card. I went for a nice clean look with this card.